North Carolina's first state constitution, drafted in 1776, contained a provision for public support of education. However, it was not until 1789 that the state succeeded in chartering an institution, a "university supported by permanent funds and well endowed." When the University of North Carolina opened its doors in 1795, it became the first state institution of higher learning in the nation. Patriot leader and Revolutionary War hero William Richardson Davie led the fight to establish the university, an effort that sprang out of the mutual strivings for enlightenment and freedom of the backcountry settlers of Piedmont North Carolina and the plantation federalists of the Coastal Plain. The first trustees selected the site for the new institution-New Hope Chapel Hill in Orange County-for several reasons. It was centrally located in the state, near the intersection of the roads from Petersburg to Pittsboro and from New Bern to Salisbury; perhaps most important, local landowners were willing to be generous in their donations, offering 1,386 acres and £798 in funds. In return, they were awarded the right to have "one student educated at the said university free from any expense of tuition." Without the assistance of regularly state-appropriated funds during its first half century, the small institution served as a collegiate training academy for the state's leaders during the entire antebellum period. Constantly assailed by sectarian controversies and financial emergencies, the university closed its doors during the turmoil of Reconstruction following the Civil War. Under the leadership of President Kemp Plummer Battle, it reopened in 1875 and steadily moved toward renewed vitality and regional eminence. 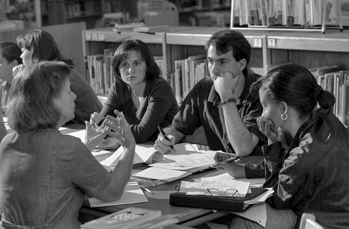 In 1885 a teacher training program became an established part of the curriculum. In 1894 the law school was incorporated, and in 1897 the university began to admit women to postgraduate courses. Three years later Sallie Walker Stockard became the first woman to earn a degree from the university, receiving a master's degree with a thesis on the history of Alamance County. At the end of the century there were 512 students enrolled, with a faculty of 35. By the commencement of 1900, 31 master's degrees and seven doctoral degrees had been awarded, the first of each in 1883. In the first two decades of the twentieth century, the University of North Carolina moved into its own in areas of liberal arts and scientific renown. The first Phi Beta Kappa chapter in North Carolina was established at the university in 1904, and in 1913 the Bureau of Extension was created to make the school's resources more widely available across the state. By 1907 a University Woman's Club had been organized. The university continued to grow, reaching an enrollment of 2,600 students and a faculty of 222 full- and 85 part-time members in 1930. In 1931 the university joined the Women's College at Greensboro (later the University of North Carolina at Greensboro) and North Carolina State College at Raleigh (later North Carolina State University) to form the consolidated University of North Carolina System, controlled by a board of trustees and having a single president with offices on the Chapel Hill campus. Through its second century, the university, now officially the University of North Carolina at Chapel Hill, thrived. The state added additional campuses to the consolidated system, bringing its total number of schools to 16. The Chapel Hill campus continued to remain in a leadership position. It established the Institute of Government (now the School of Government), the first of its kind in the nation, in 1942. The School of Public Health was established in 1936 and the Division of Health Affairs in 1949, making the university one of the few in the nation with schools in the five health professions-dentistry, nursing, medicine, pharmacy, and public health. Culturally, the Chapel Hill campus led as well. The university dedicated the Playmakers Theatre as the first building devoted to the study of theater on a public campus in 1925. The Morehead Planetarium opened in 1949, and the Ackland Art Museum in 1958. UNC's first radio station, now WUNC-FM, had its beginnings in 1953 when students began broadcasting part-time from Swain Hall; and a public television station (now WUNC-TV) was started in 1955. The university admitted African American students for the first time in 1955, following the 1951 order by federal courts to integrate its law, medical, and graduate schools. By the early 2000s UNC-Chapel Hill's academic offerings spanned more than 100 fields, including 84 bachelor's, 165 master's, and 108 doctoral degrees as well as professional degrees in dentistry, medicine, pharmacy, and law. Five health schools and UNC Hospitals constitute one of the nation's most complete academic medical centers and are integrated with liberal arts, basic sciences, and high-tech academic programs. The University of North Carolina at Chapel Hill has approximately 2,690 faculty members serving more than 25,000 undergraduate and graduate students from every North Carolina county, the other 49 states, and nearly 100 foreign countries. About 81 percent of the school's undergraduates are from North Carolina. William S. Powell, The First State University: A Pictorial History of the University of North Carolina (3rd ed., 1992). Louis R. Wilson, The University of North Carolina under Consolidation, 1931-1963: History and Appraisal (1964). Larson, Jennifer L. "DocSouth Remembers UNC's Earliest Historians." 2004. Documenting the American South, University of North Carolina at Chapel Hill. 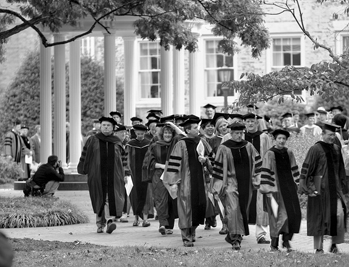 http://docsouth.unc.edu/highlights/university_day.html (accessed October 12, 2012).